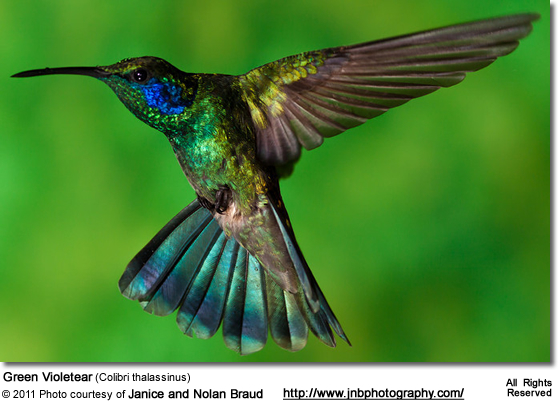 The Green Violet-ears (Colibri thalassinus) - also known as Mexican Violet-ears - are colorful hummingbirds that are found in the highlands from south-central Mexico, (the Trans-Mexican Volcanic Belt), south to western Panama and in the Andes from northern Venezuela to Bolivia. They are mostly resident in Mexico and Central America, but some seasonal movements have been observed. They may wander north to the United States (Southern California, Alabama, Kentucky, Southern Arizona, Texas, Missouri, Georgia, Florida) and a few travel as far as Canada. Thy inhabit semi-open upland country with trees and scrubs. 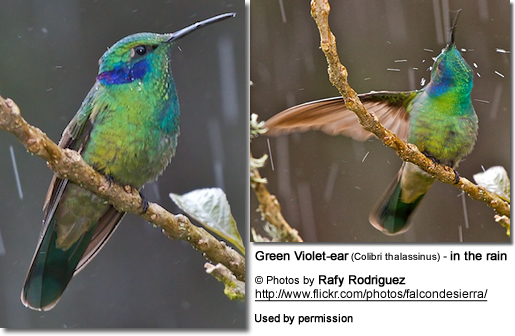 In South America, they generally prefer more humid habitats (such as the edge of cloud forests) compared to the similar Sparkling Violetear, but these two can sometimes be seen together. Found in central and south Mexico to north-central Nicaragua. Found in Costa Rica and western Panama. Found in the mountains of Venezuela, Colombia and Ecuador. Found in the Andes of Peru and Bolivia, and extreme northwestern Argentina. 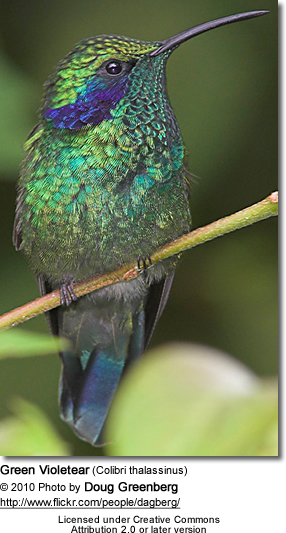 The Green Violetear averages 11 — 11.5 cm (4.25 — 4.5 in) in length. The adult male has a grass green upper plumage turning into a bronze color on the rump and uppertail feathers. The tail is square and slightly notched with a broad dark blue band at the end of the tail. The northern nominate subspecies has a large violet central breast spot on the upper breast and a violet-blue band along the chin that often connects to the violet-blue "ear", giving the bird its name. 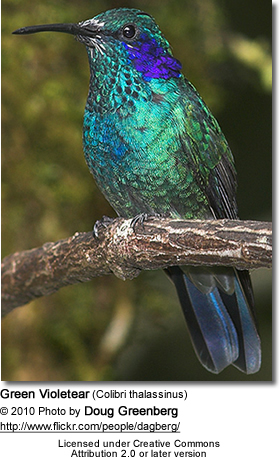 The subspecies from Costa Rica and southwards lack the violet breast spot and chin, but have the violet-blue "ear feathers" of the nominate species. 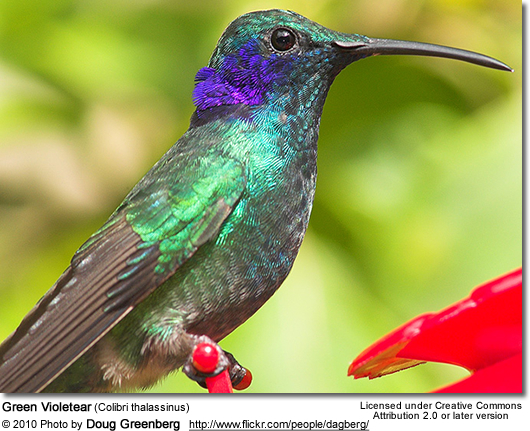 The adult female is similar to the male, but tends to be smaller in size, has a slightly duller plumage and has a narrower violet band on the chin. Immature birds: The juvenile is much duller than the adults. Its plumage is generally olive green overall with dull gray wash to the underparts. The violet breast spot is either indistinct, incomplete, or absent. A molting juvenile may show bright metallic color in patches, particularly on the throat or breast. 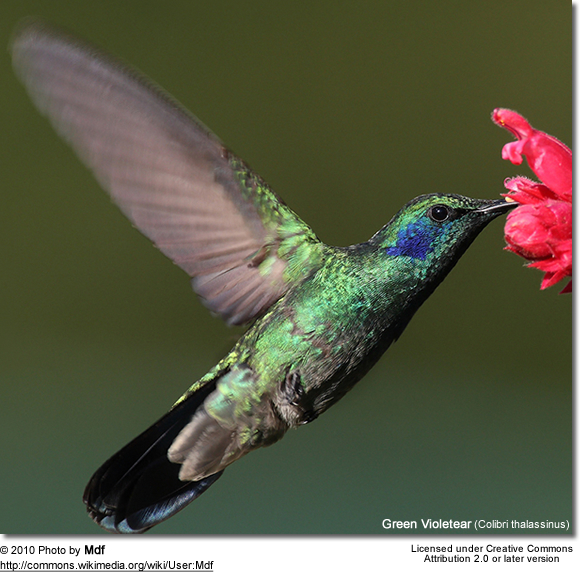 The Green Violetear's song is described as a vigorous CHEEP-chut-chut, chip CHEET - repeated throughout the day. The call is a dry chut. 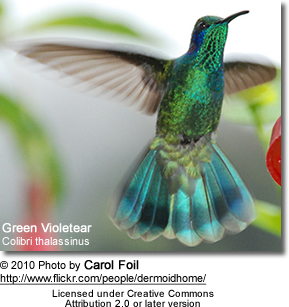 The female Green Violetear is responsible for building the deep, cup-shaped nest out of plant fibers woven together and green moss on the outside for camouflage in a protected location in a shrub, bush or tree. She lines the nest with soft plant fibers, animal hair and feather down, and strengthens the structure with spider webbing and other sticky material, giving it an elastic quality to allow it to stretch to double its size as the chicks grow and need more room. The nest is typically found on a low, thin horizontal branch situated about 3.3 - 33 ft (1 - 3 meters) high in a tree. The Green Violetears primarily feed on nectar taken from a variety of brightly colored, scented small flowers of trees, herbs, shrubs and epiphytes. They favor flowers with the highest sugar content (often red-colored and tubular-shaped) and seek out, and aggressively protect, those areas containing flowers with high energy nectar. They use their long, extendible, straw-like tongues to retrieve the nectar while hovering with their tails cocked upward as they are licking at the nectar up to 13 times per second. Sometimes they may be seen hanging on the flower while feeding. 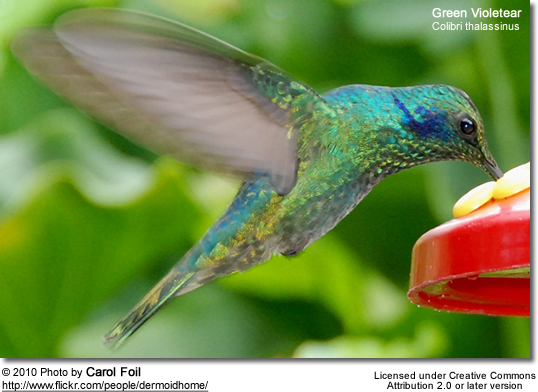 They may visit local hummingbird feeders for some sugar water, or drink out of bird baths or water fountains where they will either hover and sip water as it runs over the edge; or they will perch on the edge and drink - like all the other birds; however, they only remain still for a short moment.